In order to follow a recipe there certain basic cookery terms that you should be familiar with. There's no real secret to it and you don't need any previous experience to create a dish from scratch but it's best to be at least a little prepared. While slicing and dicing might sound similar, they're actually different processes and can affect the final taste and appearance of your dish. We'll just go through some of the basics so next time you flick through a recipe book you won't shudder and settle for beans on toast again. If you're a pasta fan this is a term you'll become very familiar with. It literally translates from Italian as 'to the tooth' and basically means cooking your pasta so it still has a little bite to it and isn't a big, soggy mess. This is when you baste meat with a sauce or marinade as it cooks (ie brush the juices from the meat over the top of the joint). Roast lamb or chicken will benefit from being basted with the juices in the pan during cooking, in order to keep the meat moist. Eggs are the usual recipients of this technique. Hold the bowl to your chest with one hand and then beat the eggs firmly with a fork or whisk, with the other hand. Some vegetables should be cooked very briefly and will literally be dropped into boiling water for a minute. You can also blanch tomatoes, and other vegetables and fruit, if you want to remove the skin. Let's face it; no one's going to be put off cooking because they don't understand this term. However, pay attention to any precedding words as you might be asked to 'roughly' or 'finely' chop and there's a big difference! Not the stuff you pour over apple pie - this is a culinary term that's often used in baking. You generally cream together the butter or margarine and sugar. This is when you chop ingredients into neat cubes. If you're a novice cook you probably won't be tackling too many recipes that call for filleting. It's a bit of a skill but once mastered is very impressive! You fillet fish and meat in order to remove the bones. A posh form of chopping whereby you cut vegetables into long, fine, even strips. A sauce (marinade) is made and meat or fish are left to soak up the juices before cooking. 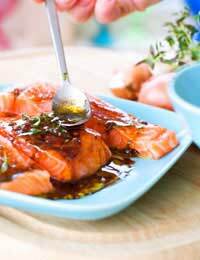 Depending on the recipe, the food might be left to marinate for anything from a few minutes to overnight. It's always kept in the fridge. Peeling the skin from a vegetable or fruit. This is a method that uses water or other liquid to gently cook food. The liquid is brought to a simmer and then the ingredients are added to the pan. Poached eggs are a healthy alternative to fried, and fish is kept moist and tender when it's poached in milk. This is finer than mashing but it's basically the same process. For really creamy potatoes, you might purée them. You can use a sieve or a food processor. Other great vegetables purées include pea, and sweet potato - both great as an accompaniment to fish or chicken. This is where food is cooked briefly over a high heat, so you might sauté onions or chopped bacon. This generally refers to salt and pepper and you'll often see this instruction in a recipe book. If it's referring to anything other than salt or pepper, it will say. Other seasonings are most likely to be spices or herbs. Simmering is a more gently way of cooking than boiling as the water doesn't disturb the food as much. To cut food into neat, even pieces. So, now that's the basics dealt with, you should feel a bit more confident about working your way through a recipe. It's all about practise and building up some confidence in the kitchen. The only way you'll do that is to roll up your sleeves and get your hands dirty. This has been my favorite research site.It always helps us to know different basic cooking terms.